Our Race Day T-Shirts are the perfect inspiration for your runners! Full of fun inspirational phrases your participants will love them! Priced so low it’s easy for you to raise funds when you re-sell to your runners. Please note – please order at least 2 weeks prior to your event date to insure that all sizes are in stock and on time shipping. If you need your product sooner please contact us. *Free shipping is only available in the continental U.S. Canada, APO's, Alaska and Hawaii orders please call 888-252-6567 for a shipping quote. In addition you will receive 1/2 pound of bulk color powder for every race kit ordered. (1/2 pound per person is the minimum amount needed if you are doing an event with 3 color stations). For example, if you order 50 race kits you will receive 25 pounds of bulk color powder. If you order 300 race kits you will receive 150 pounds of bulk color powder. The bulk color powder comes in 25 pound and 5 pound increments depending on the amount needed. You must order a minimum of 10 Race Kits to receive the 1/2 pound of bulk color powder per race kit ordered. 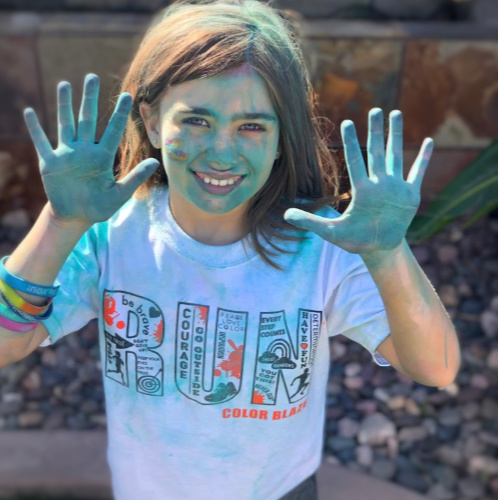 If you would like more bulk powder or are doing an event with more than 3 color stations you may order additional bulk powder by clicking on the "shop" menu above after you have ordered your race kits. Please note – please order at least 2 weeks prior to your event date to insure that all sizes are in stock and on time shipping. If you need your product sooner please contact us. When placing your order, once you get to the payment screen, please list the colors you would like for your Free Bulk Powder in the customer comments section. *Free shipping is only available in the continental U.S. Canada, APO's, Alaska and Hawaii orders please call 888-252-6567 for a shipping quote. 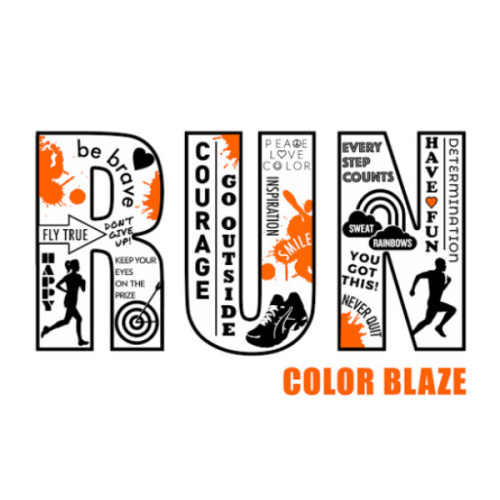 In addition you will receive 1/2 pound of bulk color powder for every race kit ordered! 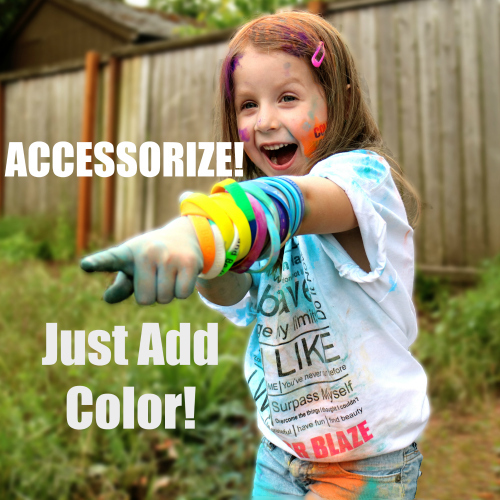 * Bulk Color Powder will be in 25 and/or 5 lb bags depending on the quantity. 1/2 pound bulk powder per person is the amount recommended if you are having an event with 3 color stations. For example if you order 100 race kits you will receive two 25 pound bags of bulk color powder. If you order 150 race kits you will receive three 25 pound bags of bulk color powder. You must order a minimum of 10 Race kits to receive the 1/2 pound of bulk color powder per race kit ordered. If your event has more than 3 color stations or you would like to order additional bulk powder just click on the "Shop" menu and add your additional powder to your cart. Our fun run tutus add some whimsy to your Color Blaze Run ensemble. Tutus are one size fits most with a waist size of 26" stretching to 44" and a length of 11". Double layer of tulle for lots of bouncy fun! Free Shipping. 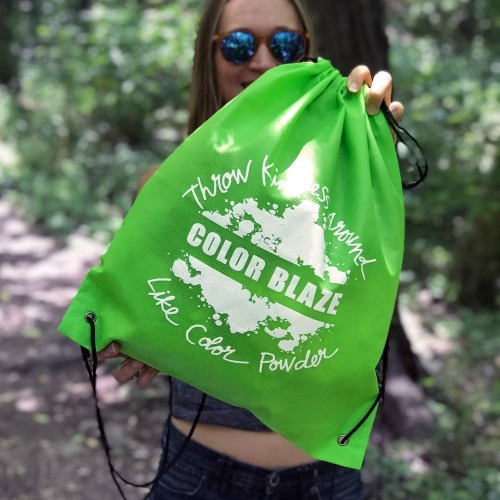 These drawstring bags are perfect for your color 5k participants to have a place to put all of their goodies! You can use them for race prizes, give-aways or make a few extra bucks and sell them! Distribute your race kits in them! Stuff them full of goodies and raffle them off! There is no end to what you can do with these handy drawstring bags. You will receive one dozen assorted colors. Bags are made of non-woven polypropylene material. 14.5" wide x 17.5 inches high. *Free shipping available inside the continental U.S. **This item ships from our West Coast warehouse. Depending on quantity ordered and location it can take up to 5 business days to ship. If you need it sooner please contact us. 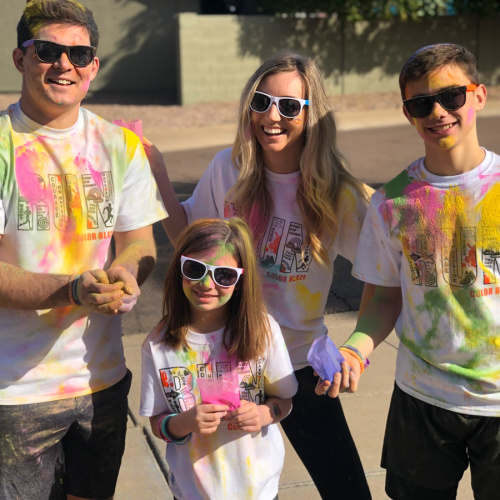 Need Shades for your fun run event? 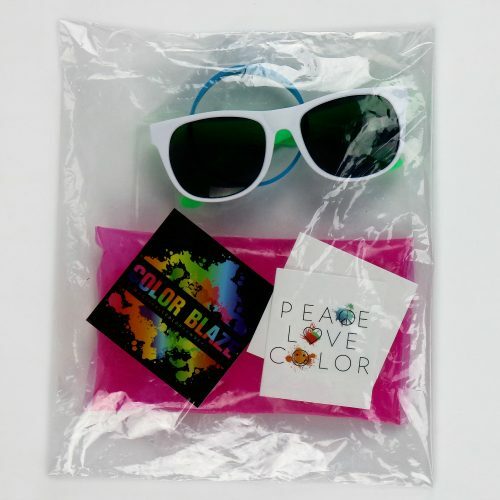 Our bright colored shades come in an assorted pack of 12. You'll receive an assortment of black and white frames with bright color accents. 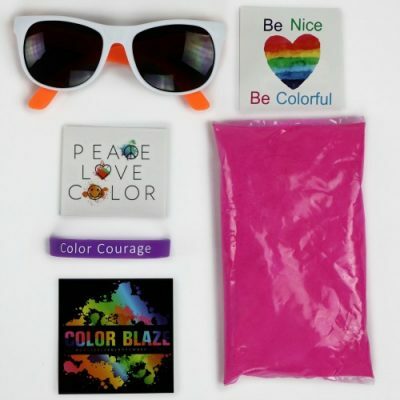 Perfect for protecting your eyes from bursts of color powder - P.S. you'll look pretty cool too. **This item ships from our West Coast warehouse. Depending on quantity ordered and location it can take up to 5 business days to ship. If you need it sooner please contact us. 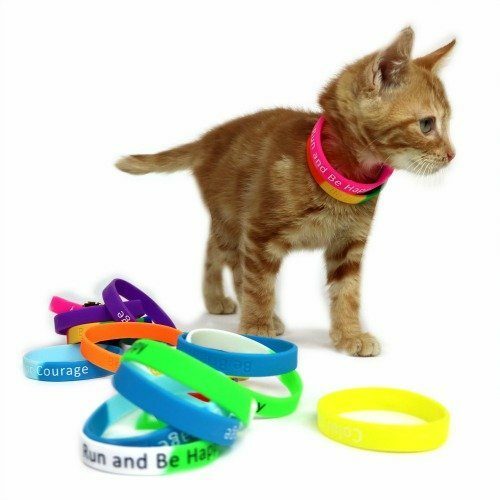 Free shipping inside the continental U.S.
Our package of 12 inspirational silicone bracelets provide a little extra encouragement to your runners. 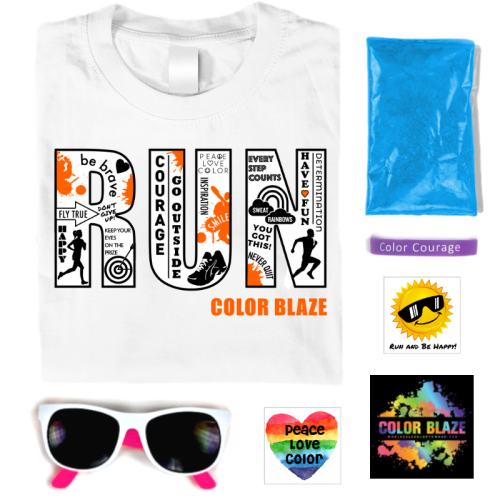 They are also perfect for color fun run give-aways or prizes! Assorted colors and sayings such as "Every Step Counts" "Start Strong. Finish Stronger" "Be Bright Be Colorful Be You." **This item ships from our West Coast warehouse. Depending on quantity ordered and location it can take up to 5 business days to ship. If you need it sooner please contact us. Free Shipping not available to Alaska, Hawaii, APO's or Canada. 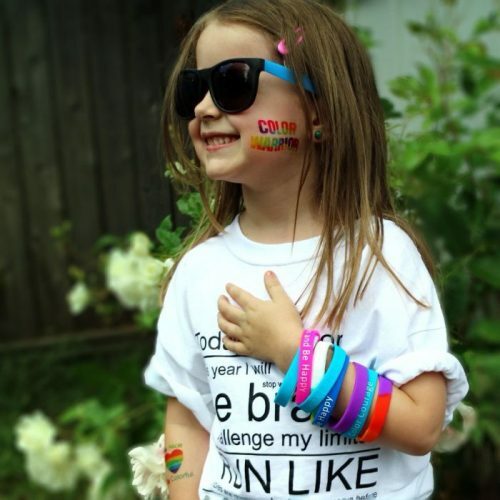 Everybody loves temporary tattoos! 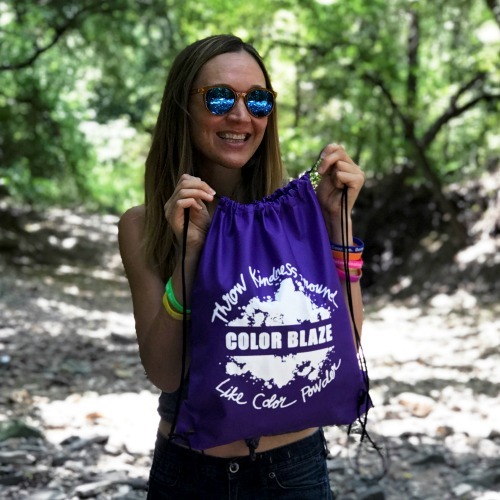 Your participants can cover themselves in a kaleidoscope of color and inspirational words for your color powder event. Perfect for goody bags and give-aways for your fun run. You will receive a random assortment of at least 4 different designs. **This item ships from our West Coast warehouse. Depending on quantity ordered and location it can take up to 5 business days to ship. If you need it sooner please contact us. Free Shipping Inside the Continental U.S.